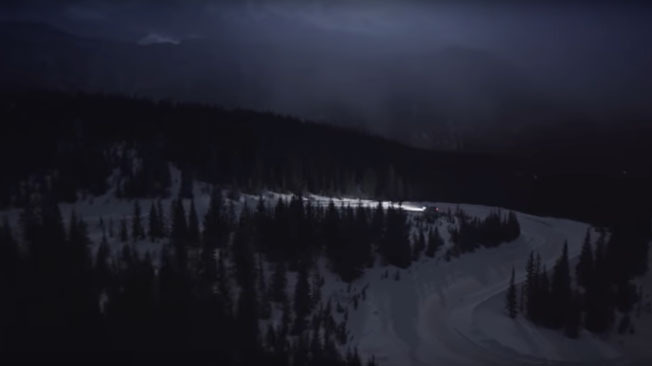 In Projection of Greatness, a new 90-second film for Audi, the Q7’s ascent of a snow covered mountain turns magical with the live action projection of its soul. Mossop shot the opening sequence of the film with the real Q7 by moonlight alone. Mossop worked alongside Zulu Alpha Kilo’s creative team and projection mapping specialist GO2 Productions to create the incredible imagery. 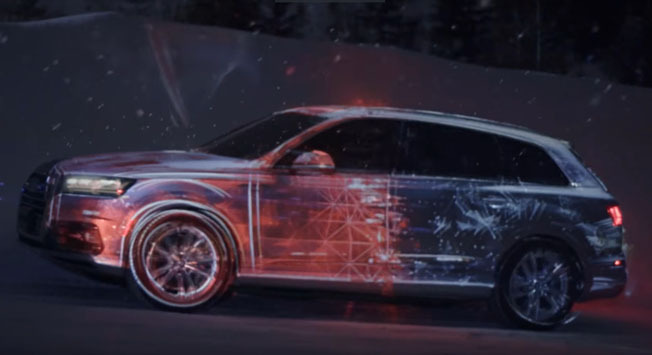 The aim of the film is to showcase the all-new Q7’s impressive mix of power, style and innovation, and how its greatness “projects” onto any terrain. The stunning display was captured entirely in-camera, with no CGI manipulation in post. Accomplice Media is a Commercial TV, Film and Digital Content production company. Film created by Zulu Alpha Kilo, director Dave Mossop and GO2 Productions features groundbreaking projection mapping imagery shot and lit only by moonlight. 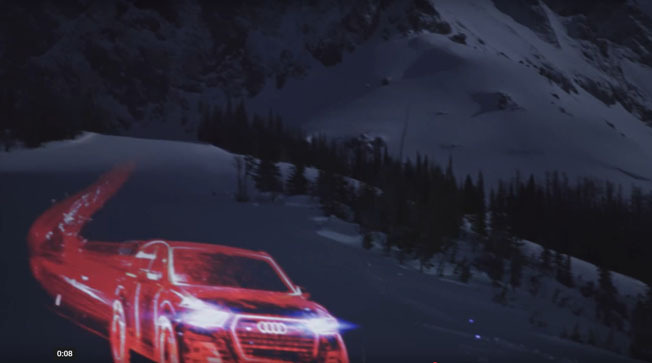 In Projection of Greatness, a new 90-second film for Audi, the Q7’s ascent of a snow covered mountain turns magical with the live action projection of its soul. 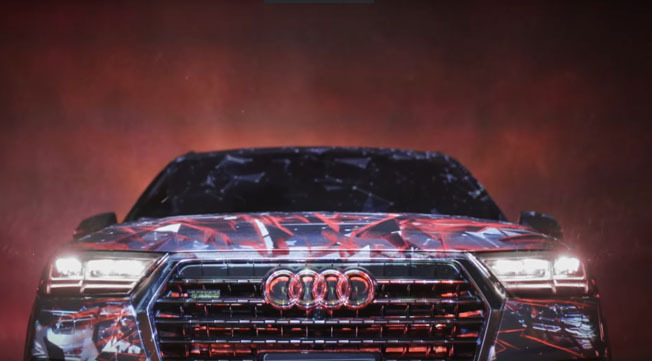 Conceived by Toronto agency Zulu Alpha Kilo, directed by Dave Mossop of Sherpas Cinema and Accomplice Media, and featuring projection mapping by GO2 Productions, the stunning display was captured entirely in-camera, with no CGI manipulation in post. 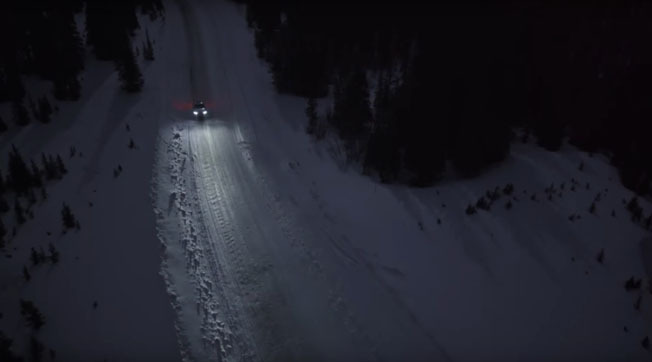 The aim of the film is to showcase the all-new Q7’s impressive mix of power, style and innovation, and how its greatness “projects” onto any terrain. It opens on a silver SUV making its way along a twisting, snow-covered mountain road under moonlight. The stars and the flying snow transform the vehicle into a fully animated version of itself that streaks up the side of the mountain. Agency: Zulu Alpha Kilo. Zak Mroueh, Chief Creative Officer; Allen Oke, Executive Creative Director; Jon Webber, Creative Director/Copywriter; Allan Mah, Senior Art Director; Tara Handley, Christine Pacheco, Clair Galea and Ola Stodulska, Agency Producers; David Tremblay, Account Director; Lance Kowlessar, Account Supervisor; Emma Brooks and Jamie Cuthbertson, Strategic Planning. Production: Sherpas Cinema, Accomplice Media. Dave Mossop, Director; Malcolm Sangster, Executive Producer; Byron Kopman, D.O.P. Edit: Sherpas Cinema, Dave Mossop, Jay Baker, Will Biname, Editors. Color: Color Matters Eric Rosen, Colorist. Audio: Jacob Yoffee, Composer/Audio Engineer. Projection Mapping: Go2 Productions. Adrian Scott, Executive Creative Director; Craig McEwen, Creative Director; Joe Surachet, Art Direction/3D Animation; Nash Sittisarebute, Compositor/Visual Effects; Marie Laderoute, Production Manager; Scott Justis, Technical Producer; Liz Toscano, Production Manager; Dan Mulcahy Qlab, Programmer; Carr Salvo Lead Projectionist.